Work is redefined with the unique facilities available at levels 15 and 16 of Wangsa 118. IMAGINE - take a refreshing dip at the sky view swimming pool before leaving for home; go for a quiet stroll at the pool deck or workout at the unique glass fronted 2 level gym and lounge. A rooftop garden at Level 7 is also available. Level 15 is exclusively devoted to the swimming pool and gym, while the lounge and meeting rooms are located at level 16. It’s all part of the iconic corporate lifestyle here at Wangsa 118. The retail Atrium is carefully designed and planned to maximize your potential success. 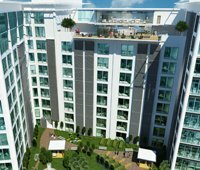 There are only 31 units with cantilever F & B terrace, spread over 3 levels, so retail space is definitely much sought after here at Wangsa 118. All 3 levels are accessible via escalators, lift and a glass see-thru elevator. Contributing towards your retail business success will be the fact that Setiawangsa and Wangsa Maju are vibrant and mature townships. The large section of the population from the upper middle income group, constitute the primary captive market for your retail outlet. Your office space, whether in the North, Central or South Towers, is your domain; and Wangsa 118 offers you the perfect choice by virtue of its layout, exclusivity, location and facilities. Entrepreneurs, professional firms, service organizations or corporate headquarters address – you will find your needs amply met. There are 4 units of commercial outlets suitable for financial institutions or specialty stores on the Ground, First and Second floor of the North Tower. There are 180 units of signature office Suites on 8 levels, ranging from SOVO (Small Office Versatile Office) of 665 sq ft to 4,329 sq ft; and another 8 units of duplex Penthouse Suites on the highest 2 levels, all with individual washroom and shower in each unit, to give you more comfort and convenience.